One4all are partnering with CMRF, the fundraising arm of Crumlin Children’s Hospital, to help put a smile on the face of a sick child. 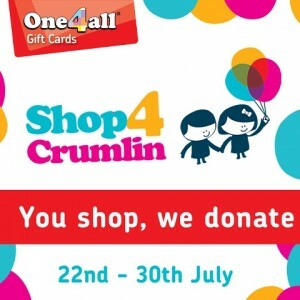 One4All are asking shoppers to dig out their One4all Gift Cards during One4all’s Shop4Crumlin Week, 22nd-30th July. One4all will donate €0.50c to Crumlin Children’s Hospital every time a One4all Gift Card is used for payment in a JD store from 22nd-30th July. An Post and TodayFM will be creating awareness of the campaign also. Shop4Crumlin/Shoppers week takes place Saturday 22nd-Sunday 30th July 2017. One4all will donate €0.50 cent on every One4all transaction in JD during the period. There is no cost to take part as One4all are making the donation. Point of Sale will be used to create awareness of this campaign in JD store. The money raised for CMRF Crumlin through Shopper’s week will go towards The Giggle Fund, a fund that the hospital departments use to brighten the spirts of little ones. This money enables CMRF to help sick children to forget about their illness even just for a short time. Be it a little girl having her nails painted on her birthday, a young boy given the coolest Superhero toy after a fearful time or some kids getting a special visit from Santa Clause at Christmas.